As the fifth president of the United States, James Monroe had big shoes to fill, including those of Thomas Jefferson and George Washington. Monroe was known for being the last president who was also a founding father of the United States, the last president who was a Revolutionary War veteran, and as the author of the Monroe Doctrine, which espoused the position that no other European nations would become embroiled in American policy or national business. Monroe dropped out of college to join the Revolutionary War as an officer. He was shot during the war and spent about three months healing from his injuries. After the war, he studied law under Jefferson and went on to pass the bar and practice law in Virginia. Like many of the early presidents, Monroe owned both plantations and slaves. Monroe’s slaves were often said to be treated harshly by the overseers who ran his plantations for him. Monroe married Elizabeth Kortright in 1786. He met his future wife during his time in the Continental Congress, and together they had three children. Monroe began his political career as a delegate in the Continental Congress. He was against many of the ideals of the Federalist Party, and he was especially opposed to giving federal government too much power. In fact, he even opposed ratification of the United States Constitution. Additionally, Monroe served in the Senate of the first U.S. Congress, as well as the ambassador to France, governor of Virginia, and secretary of state and secretary of war under James Madison. Monroe was also named ambassador to Britain under President Jefferson, and he fought aggressively to allow extension of the Jay Treaty, which guaranteed trade between the U.S. and British empire after a 10-year expiration date. Monroe went so far as to sign a renewal of the treaty with the British in 1806. However, it should be noted that at the time the original Jay Treaty passed, he had been vehemently opposed to it. 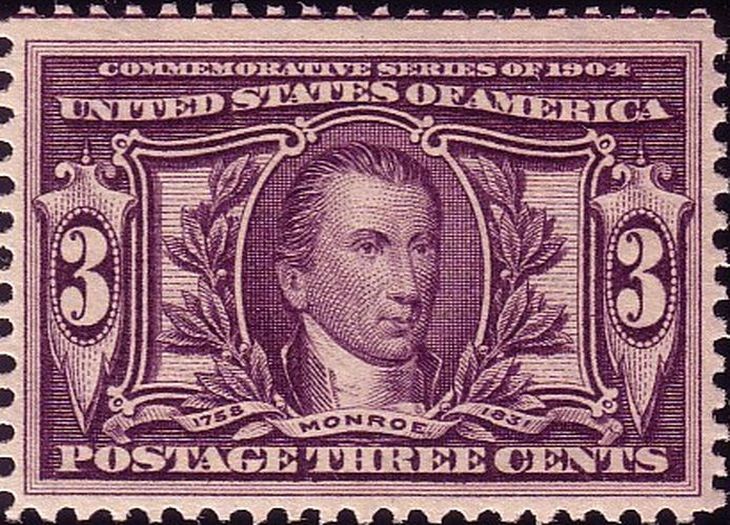 In 1816 Monroe was elected president. During his presidency, he continued adding to the nation’s land ownership by buying Florida from Spain and securing the 42nd Parallel border on the Pacific Ocean. In fact, Monroe wanted to expand America’s empire by founding colonies of free African Americans in Africa, and he opposed intervention by other nations in American policy by introducing the Monroe Doctrine. Like Thomas Jefferson and John Adams, James Monroe also died on Independence Day, July 4. During his time as governor of Virginia, Monroe used the Virginia militia to stop a slave rebellion and then hanged 26 of the slaves who had participated. He was also in favor of limiting education for slaves. Monroe had no known religious affiliations and is considered one of the least religious presidents to ever serve.